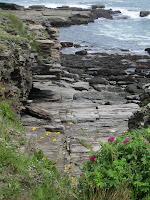 Returning to Two Lights State Park in Cape Elizabeth, Maine reaffirmed the awe-inspiring beauty of this place. 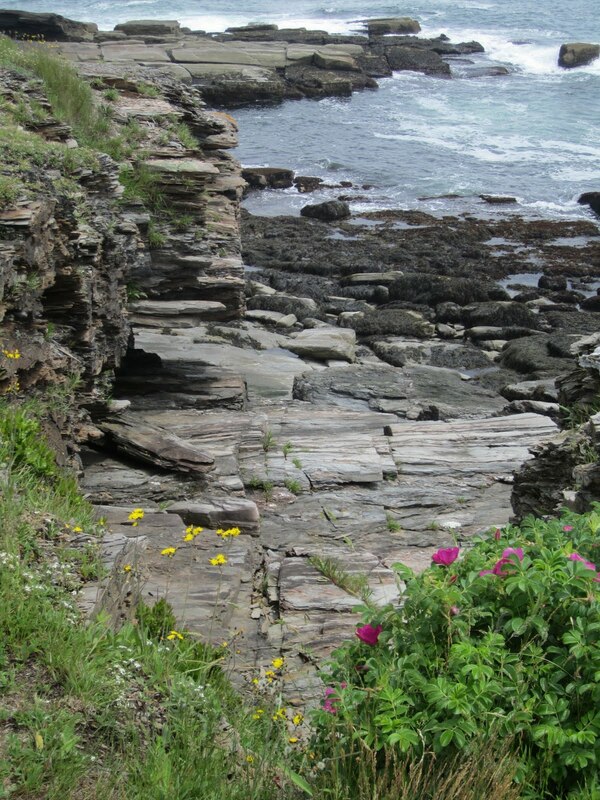 Although an earlier visit was full of light and sun, this time bright flowers and the grey sky added drama to the rocky coast line. Children peered into tidepools and people scurried on the rocks to stare at the waves. Even with a few people, this place is still a place to think, to draw, to write or to explore. We were content, having picked up delicious salads at the nearby Good Table. My memory of the Good Table is of their spectacular cinnamon buns. They were out of those, and I had already reveled in my croissant from Standard Bakery. So, my mom and I were thrilled to open our takeout containers and discover freshly grilled chicken on top of beautiful greens. I had the chef salad, and so my chicken shared the salad with bacon, an egg, and blue cheese. On the side, a warm and thick pita-type flatbread. We ate, staring at the view, silenced by the shore. After we drove a bit further down Two Lights Road, hoping to see the actually "Two Lights." Instead we came upon a future visit: The Lobster Shack restaurant which may have the ultimate in views as it, too, is directly on the ocean. Lobster Shack is highly recommended! I had a wonderful plate of fried scallops there and have been dying to go back ever since. Glad you liked it! I have never seen a restaurant so perched on a cliff. Just amazing!